Despite Bernie Sanders’ efforts to identify Denmark with some sort of democratic socialist utopia where a highly-interventionist government regulates all the nooks and crannies of the economy, the success of this Scandinavian country is closely linked to its high degree of economic freedom. We just need to look at the latest Index of Economic Freedom, published every year by the Heritage Foundation, where Denmark ranks in the top 15 worldwide. When looking more closely, Denmark excels at two specific economic indicators: business freedom and labour freedom. The business freedom indicator places Denmark at the top of the ranking, only behind Hong Kong. As for labour freedom, Denmark finds itself in the top 6. 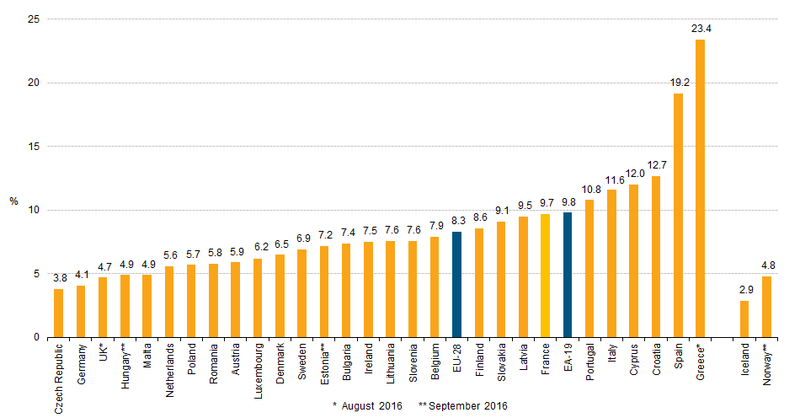 The strong correlation between labour freedom and low unemployment rates seems to explain why Denmark has one of the lowest unemployment rates in the EU. In the following lines, I aim to explore the specific characteristics that make the Danish labour market an example to follow in many ways. In fact, negotiations at the enterprise level have gained importance over the last decades as revealed by the percentage of employees covered by the standard-wage system as opposed to the minimum-wage system, which moved from 34% in 1989 to only 16% in 1994, remaining at that level ever since. Under the increasingly less relevant standard-wage system, salaries are negotiated at the sectoral level and individual companies are not allowed to modify the sectoral agreements. In contrast, the minimum-wage system described above (which is predominant nowadays) allows companies to use the sectoral agreement just as a reference to set their wages, the company being the epicentre of this wage-formation process. What is the role of the Danish government in this process? None. The government does not interfere in the way wages are determined. This becomes obvious by the fact that there is no legislation that establishes a minimum wage on the national level. The Danish labour market is based on the concept of “flexicurity”. This concept, firstly coined by the former Prime Minister of Denmark Poul Oluf Nyrup Rasmussen, refers to the two main characteristics of the Danish labour market: flexibility and security. In terms of flexibility, firing costs are minimal. For instance, a white-collar worker who was unfairly dismissed today would receive a compensation of maximum four months of salary after working for 10 years in the company. This flexibility is reflected in the fact that 25% of private sector workers change jobs every year. Moreover, employers are incentivized to hire through very low social security contributions, which do not exceed 2% of the employee’s gross salary. The second pillar of the system is security. Employment security is given priority over job security, meaning that the focus is placed on preventing employees from being away from the labour market for long periods of time rather than shielding them in their current positions. This is achieved by combining flexibility with considerable unemployment benefits (usually 90% of the last salary during a maximum of 4 years) and effective policies aimed at relocating the unemployed. These benefits are, in turn, accompanied by sanctions in case the job seeker refuses to accept a job offer. A well-functioning and efficient labour market is, no doubt, one of the ingredients that account for Denmark’s economic prosperity. It is certainly responsible for the low unemployment rates that the country has enjoyed over the last decades. The Danish experience should open the eyes of those European governments that refuse to liberalise their labour markets. The evidence is clear: labour flexibility results in lower unemployment. Will the Danish example be followed by those countries badly hit by the plague of unemployment? Spain partially liberalised its labour market four years ago, and the reform seems to be yielding positive results. Who will be next? This article was first published by European Students for Liberty & the IEA blog.